Wadel, G.; Zamora, J.Ll. 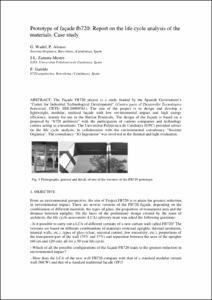 ; Garrido, P.
Wadel, G.; Zamora-Mestre, Joan-Lluis; Garrido, P. Prototype of façade fb720: Report on the life cycle analysis of the materials. Case study. A: International Conference on Building Sustainability Assesment. "Proceedings of 1st International Conference on Building Sustainability Assesment". Porto: 2012, p. 708-719.